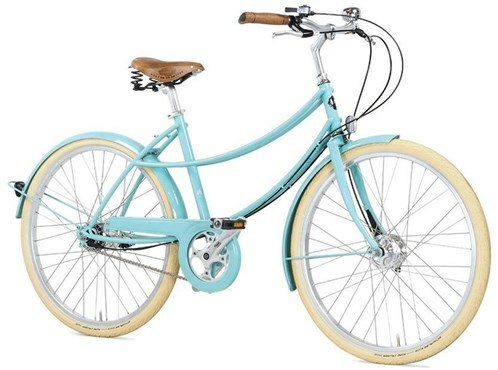 Enjoy easy going commuting with the Pashley Penny hybrid classic bike. The frame is hand-built using traditional techniques, making sure you receive the quality that comes with such a classic design. A 5-Speed Sturmey Archer hub gives enough gearing for town riding along with minimal maintenance, while the hub brakes make sure you have all-weather stopping performance. The Brooks leather saddle is a fantastic place to be and offer premium comfort. Soft touch cork grips: with ergonomic shaping these soft-touch cork-compound grips give added comfort and secure handling whilst cycling. Rims: 26" polished alloy rims with stainless steel spokes. Front Tyre: 26" polished alloy rims with stainless steel spokes. Rear Tyre: 26" polished alloy rims with stainless steel spokes.